From time to time, the world of the unexplained and inexplicable offers up a rare opportunity. Thus far in my experience there has been a house offered as reward for proof of the existence of Bigfoot, and recently an IPO investment opportunity for proof of Bigfoot. Today I bring you your chance to be a star! From SuperNaturalUFO.com Your chance to star in a UFO Documentary. We are primarily interested in those who are active in seeking out experiences and sightings. The film is being made for distribution on the film festival circuit. We have very little budget but would be able to cover expenses. The subject of the film must be willing to speak on camera about their life and experiences and allow us to film in their home and also out UFO hunting. Interested parties can contact John direct at [email protected] or you can contact me at [email protected] and I’ll pass your details on. My website is just about my work (Im a cinematographer) and the production company, Deerstalker Films, doesn’t have a site yet (it’s only just been formed) but feel free to direct people to my site if you want – hopefully it shows that we’re not a bunch of amateurs. I don’t have a long history in the realm of the paranormal – basically our interest in the UFO subject is more from a human point of view – examining it through looking at one individual. We made a documentary about a man called Roy Vincent who hears voices – he thinks that they are “spiritual intrusions” but he has been diagnosed as schizophrenic – our film didn’t come down on either side of that conflict – rather it examined how this phenomena has derailed his life. I suppose we’re looking to do something similar on this subject – it’s not so much about what these things in the sky are – more what motivates skywatchers, what makes them get up in the morning? Why is the idea that aliens are visiting us so attractive? etc etc. We’re not looking to prove the existence of aliens but we’re not trying to do a hatchet job on anyone either. We hope to make a film about a person rather than a phenomena. We’d love to keep you up to date with the progress of the film and invite you to a screening at a festival. Festival wise we’ll probably be looking to distribute it internationally but of course, it depends on how good the finished piece is! Thanks for your on going help! Whether the UFO, or any other unexplained phenomena is really what people claim it to be, or a natural phenomena we have yet to understand, the search is always about people and what drives them. I look forward to this movie and hope to bring you updates on it’s progress and eventual release. If you are someone who might fit what is being sought, or know someone who does, get in touch with Mr. Craine, or send the info to me and I will forward it happily. 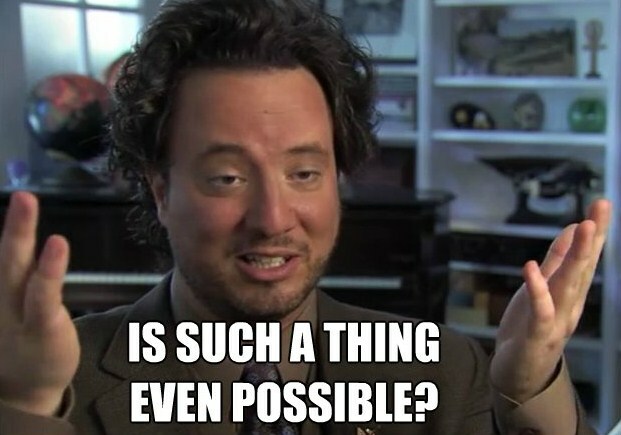 All I can add is: Hurry before Giorgio Tsoukalos tries to sign on! Extreme Expeditions: Cloaked Figure Caught On Camera. Sasquatch?